Evelyn writes and performs music for film, TV, radio, theatre, library companies and live performance, often collaborating with other media composers. Her unique style and immense array of instruments in her personal collection make for a distinctive sound experience. Evelyn’s media credits include several multi-award winning films: The Trench WW1: a story of a group of young British Soldiers in the run-up to the Battle of the Somme. 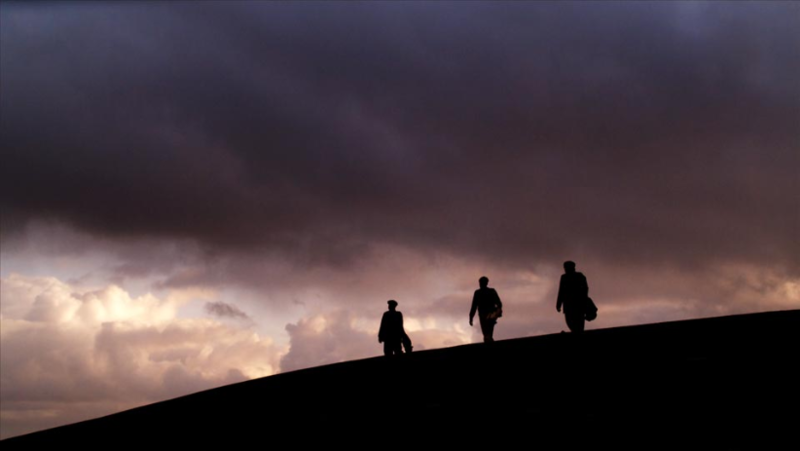 Golf in the Kingdom: featuring a young American philosophy student who takes a detour to the Scottish Links of Burningbush in 1956. A Dangerous Journey: has been shown to governments around the world to highlight the humanitarian crisis of people trafficking. Touch the Sound: which explores the nature of sound and its effect on our everyday lives. Whirlpool: featuring the early adult life of Helen Keller. Finding Altamira: a true story of the discovery of cave paintings. 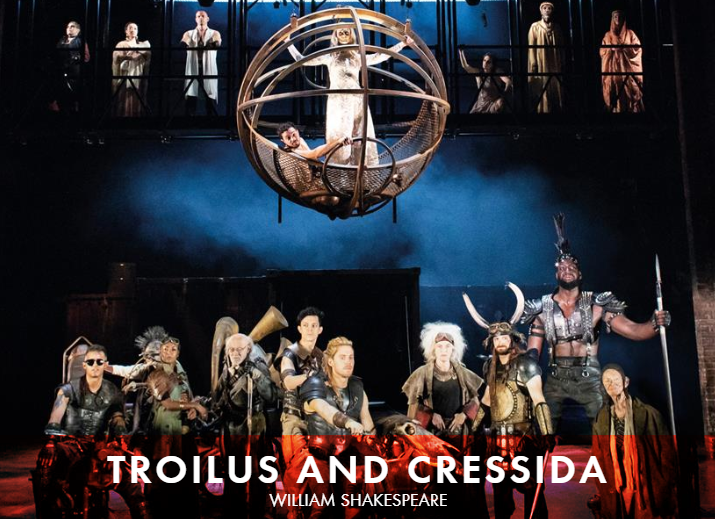 Her first theatre music score was written in 2018 for the Royal Shakespeare Company’s Production of Troilus & Cressida. Evelyn’s concert works include a host of pieces for Solo Percussion as well as a collection of piano works designed for younger players. Some of these have been included in the Associated Board Examination list. Educational classroom music books have also been written. You can explore more of Evelyn’s compositional work below. Our Unique Projects page also includes projects where Evelyn plays the role of the composer and/or improviser. Evelyn writes and performs music for film, TV, radio, library companies and live performance. She regularly collaborates with other composers and has already worked with Fred Frith, David Motion, Terry Devine-King, MJ Cole, Ray Davies, Steve Hackett and Philip Sheppard. Evelyn’s unique style and the dizzying array of instruments in her personal collection make for an unforgettable sound. Evelyn’s media credits include several multi-award winning films. A Dangerous Journey has been shown to governments around the world to highlight the humanitarian crisis of people trafficking. Touch the Sound, which explores the nature of sound and its affect on our everyday lives, features Evelyn on-screen as well as on its soundtrack. Evelyn’s concert works include classics such as A Little Prayer plus a host of pieces designed for young and beginner musicians. You can explore the full wealth of Evelyn’s compositional work below. Be sure to check-out our Unique Projects page, which includes projects where Evelyn has played a role as composer and/or improviser. If you would like to engage Evelyn as a composer then please do contact Brenda, who will be delighted to discuss your proposal. Click the image to watch the Troilus and Cressida trailer. Based on the true story of civil rights activist Hellen Keller, this 17 minutes short film by Kate Baxter and Elizabeth Dixon, completed in May 2017, is attached to a feature film screenplay. 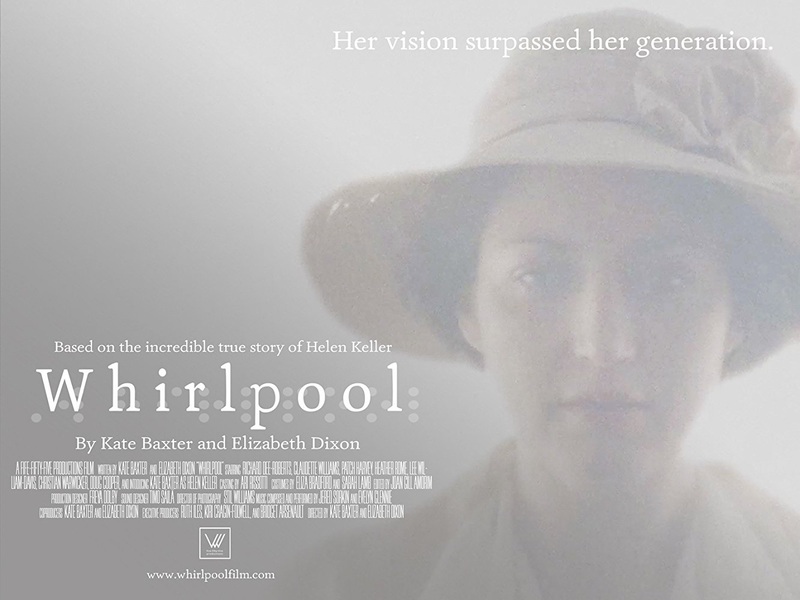 As Whirlpool creators, Kate and Elizabeth read Helen Keller’s words, interviewed experts and Helen’s and other character’s loved ones, it moved them to create beyond the short film. With a feature film screenplay, a documentary in production about topics close to Helen Keller, and a partnership for new technologies for better accessibility, this project is the gateway to a continuation of the work that Helen Keller began in the early 1900’s. Alongside Jered Sorkin, Evelyn created a compelling music score to not only be heard but physically felt, that transcends two-dimensional cinema and connects to the raw drive of Helen Keller. Click the image to visit Whirlpool’s website. In 1879, Spanish archaeologist Marcelino (Antonio Banderas) and his daughter Maria (Allegra Allen) discover seemingly impossible paintings of galloping bison adorning the walls of a hidden cave. The cave of Altamira brings the world together in amazement, drawing people of all types to see the paintings in person. But, Marcelino soon realizes that the art on the walls must be 10,000 years old, earlier than anyone believes possible. The theory threatens to tear Maria and Marcelino’s family apart while the outside world’s astonishment soon turns to fury and fear. 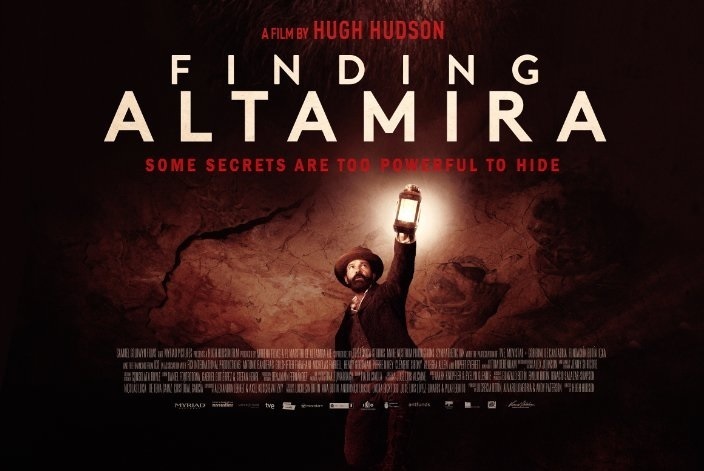 Finding Altamira marks Hugh Hudson‘s return to the Director’s chair after a 15 year absence from feature films and features music composed and performed by Evelyn and Mark Knopfler. Click the image to see the trailer for Finding Altamira. Evelyn joins celebrity of the technology world Paul Sonderegger as the star of this short film about Big Data. Released by technology giants Intel and Oracle (where Sonderegger works as Big Data Strategist), the film rationalises the baffling world of Big Data, making it easier to understand and a more meaningful part of our everyday lives. Using the analogy of percussion-playing and the example of air traffic control, we’re encouraged to notice the surprising symmetries between Big Data and our sonic environment, both of which we tend to ignore. The on-screen conversation is accompanied by Evelyn’s newly composed soundtrack, co-written with Simon Lacey, which aims to mimic the structures and diversity of Big Data in a thrilling musical landscape. Click the image to watch The Invisible Made Audible: Percussion. Produced in response to the increasing number of women being trafficked out of Africa, especially Nigeria, A Dangerous Journey warns young African women not to be tricked into prostitution by traffickers. The script was created with the help of trafficked women from West Africa as well as Nigerian and Ghanaian women prisoners in the UK. 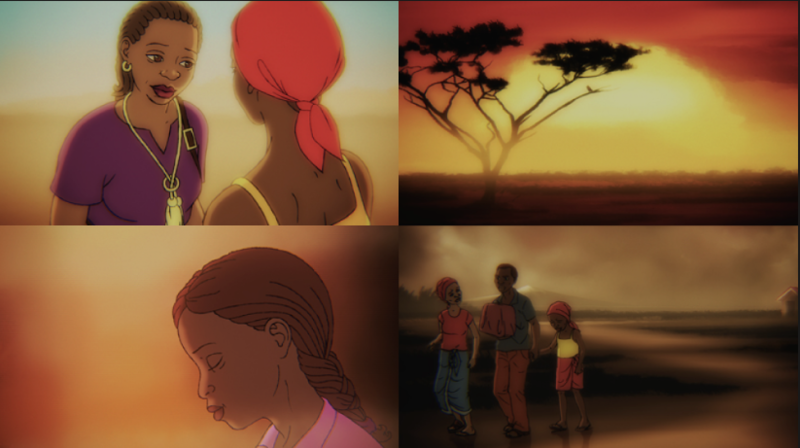 The film was launched in Nigeria in 2012 and has been shown around the world, notably in countries where trafficking persists. It won the Gold World Medal at the 2013 New York Festivals and the 2013 Human Trafficking Foundation Media Award. Evelyn co-composed the score with Philip Sheppard and also features as a performer. Click the image to watch A Dangerous Journey. Golf in the Kingdom is adapted from Michael Murphy’s 1972 classic novel, the best-selling work of fiction ever written about the game of golf. The story follows a young American philosophy student who, in 1956, takes a detour to the Scottish Links of Burningbush. Seeking one last round before giving up his beloved game, he is thrust into an adventure with a mysterious and mischievous golf pro. With such a distinctively Scottish setting Evelyn was an obvious choice as composer, who, along with co-composer Ian Dean, provides a memorable and colourful soundtrack. Click the image to watch a trailer for Golf in the Kingdom. 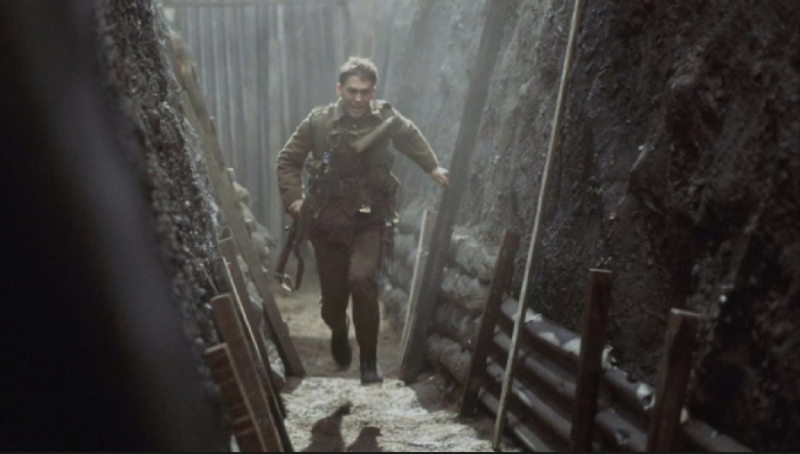 The Trench, directed by William Boyd, tells the story of a group of young British soldiers in the run-up to of the Battle of the Somme, unaware of the horror that will soon unfold in front of them. The film stars Daniel Craig, Paul Nicholls, Ben Whishaw, Danny Dyer and Cillian Murphy, who relate the gamut of emotional experiences that WWI soldiers had to endure in their extraordinary circumstances. Alongside Greg Malcangi, Evelyn wrote and performed a highly distinctive score that depicts the volatile emotional and physical situations faced by the film’s protagonists. Evelyn enjoys a long-standing relationship with Audio Network, one of the media industry’s fastest growing music library companies. Evelyn regularly works with a number of producers and co-composers to achieve a diverse portfolio suitable of the highest quality. 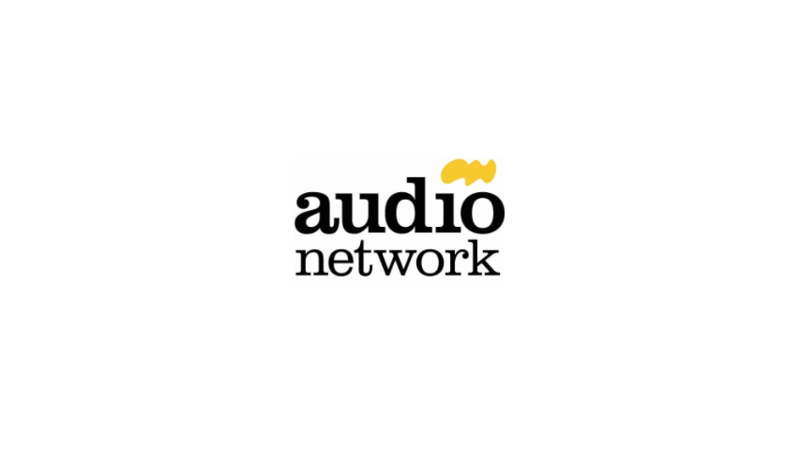 Click the Audio Network logo to go straight to Evelyn’s catalogue on their website, where you can licence Evelyn’s Audio Network tracks. 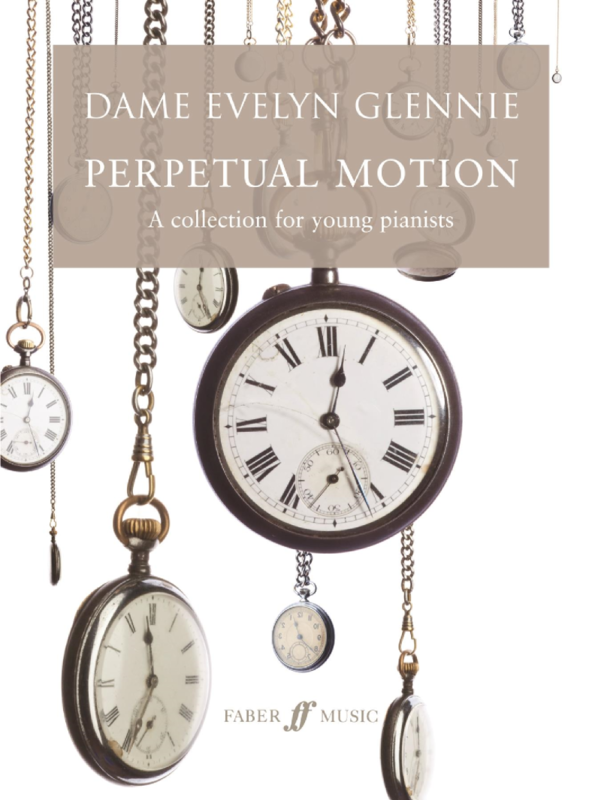 Perpetual Motion is a collection of ten evocative pieces for young pianists to explore and enjoy. Each piece was conceived to focus on a particular technical requirement yet is also a complete piece of music in itself, which should be interpreted as a little sound story. Suitable for players of approximately grade 3-5 level. Percussion versions, arranged by Evelyn, were released in early 2015. Click the image to view Perpetual Motion in our online shop. A brilliant resource for both general and more specialised music teachers working with beginner percussion groups. Presenting 16 contrasting workshops based on traditional music of the Caribbean, it provides invaluable material for performers aged 8 and up. Inspired by the thrilling music of Africa, the pack shows you how to develop a terrific range of rhythmic ideas using everyday classroom percussion and the body. Co-written by Evelyn and Paul Cameron, the printed music includes a CD containing performances performed by Paul Cameron and Richard King. Click the image to view Beat it! 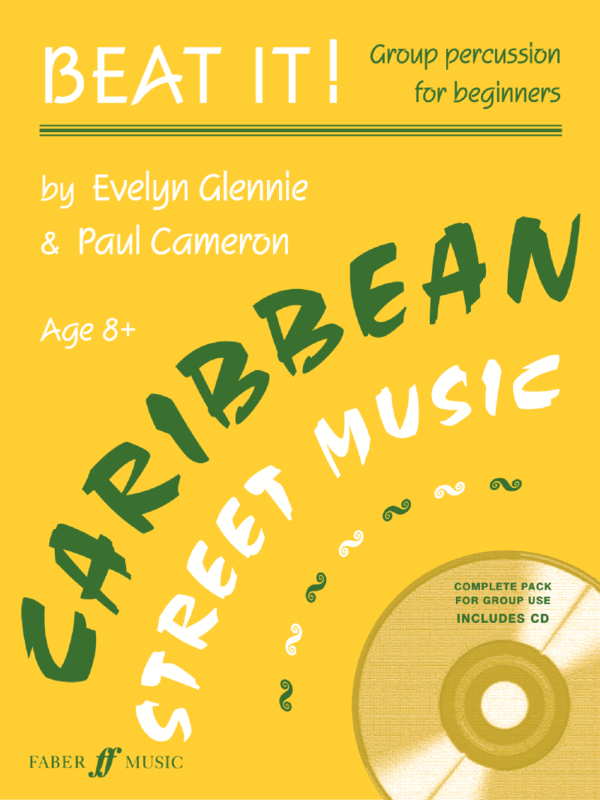 Caribbean Street Music in our online shop. 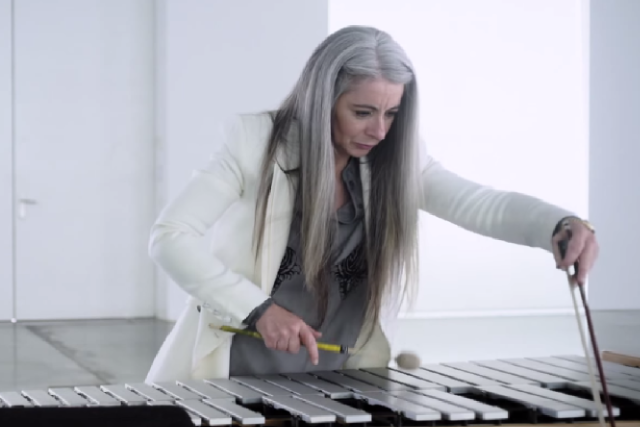 For many, Evelyn Glennie’s encores are the highlight of her performances. These six exquisite, simple melodies, transcribed and arranged by Evelyn, are ideally suited to the emotional qualities of the marimba and are enjoyed immensely by audiences all over the world. Evelyn writes: ‘There has always been a place in my repertoire for simple and truly beautiful melodies. The six in this collection are ideally suited to the emotional qualities of the marimba and I frequently perform them as encores. The melodies are known almost universally and always give immense joy to all who experience them – myself included – were in the world I happen to perform them and whatever the occasion’. 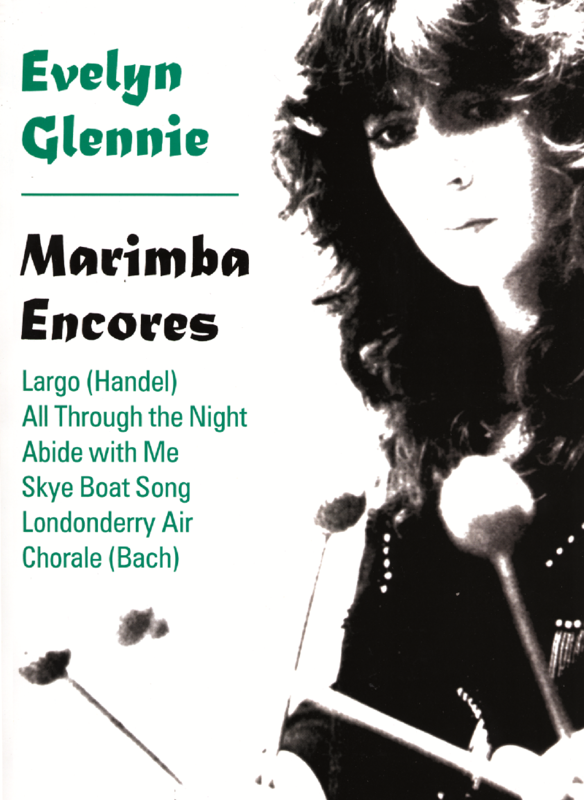 Click the image to view Marimba Encores in our online shop. A brilliant resource for both general and more specialised music teachers working with beginner percussion groups. Presenting 16 contrasting workshops based on African dances, it provides invaluable material for performers aged 8 and up. Inspired by the thrilling music of Africa, the pack shows you how to develop a terrific range of rhythmic ideas using everyday classroom percussion and the body. Click the image to view Beat it! 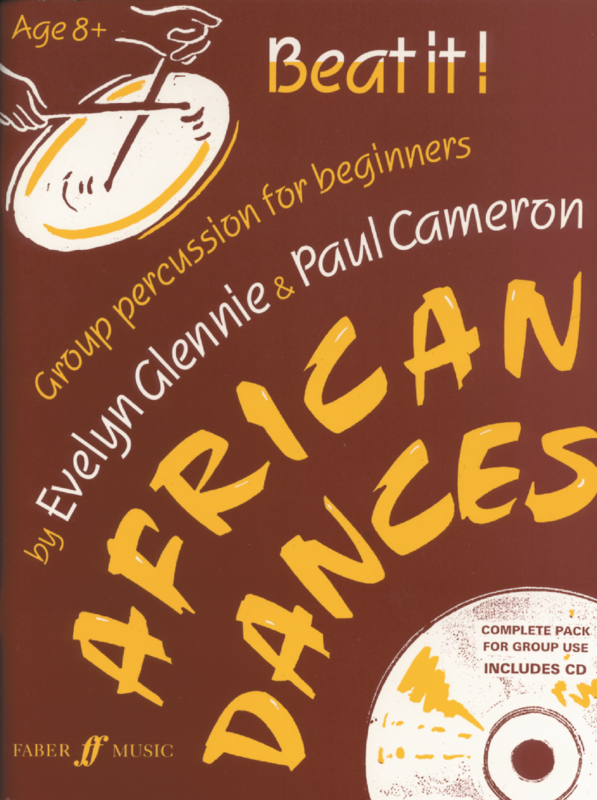 African Dances in our online shop. Evelyn particularly likes writing and arranging for the marimba. Her Three Chrorales for solo marimba, published here for the first time, are hauntingly beautiful pieces, which take full advantage of the unique sonority of the instrument. Their simple chorale style makes them accessible to both the professional and the student player. Evelyn writes: ‘My Three Chorales for solo marimba were written at different times as individual pieces, and not originally intended as a set to be played together. A Little Prayer and Light in Darkness were written when I was 13 years old, expressing my spiritual feelings and at the same time displaying a pleasantly relaxed dimension to the instrument. Giles is dedicated to a friend who was tragically killed in a climbing accident. All three pieces are in a simple chorale style and take full advantage of the unique resonance of the marimba’. 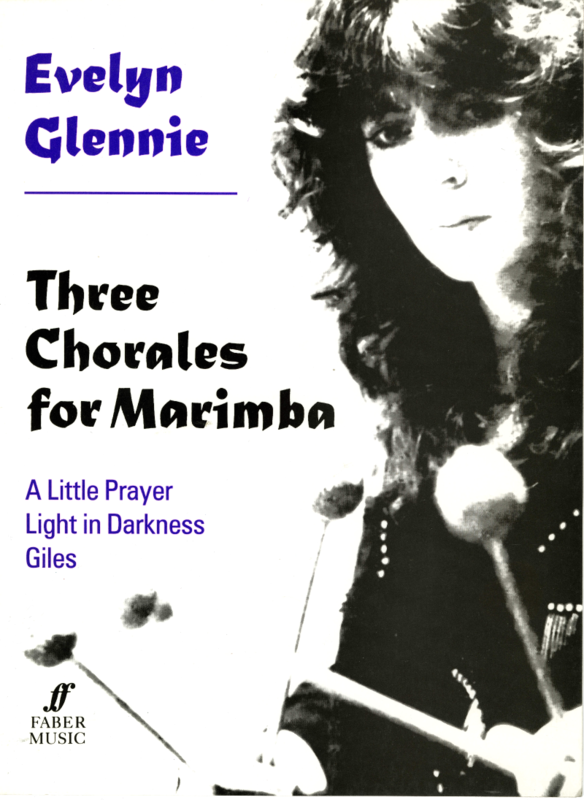 Click the image to view Three Chorales in our online shop.